ALJ Regional Holdings “ALJ” owns KES Acquisition Company (KES/Kentucky Electric Steel) which in turn owns a steel mini-mill in Kentucky. This mill converts scrap steel into bar flats for several different industrial uses. This process typically has lower production costs than producing steel from raw materials. Mr. Jess M. Ravich is Chairman of the Board and also owns a substantial interest in the company’s common stock, preferred stock and debt. Mr. Ravich has an extensive background in leveraged finance, having worked for Jefferies and Drexel Burnham Lambert prior to founding Libra Securities in 1991. Under Mr. Ravich’s leadership, ALJ assumed majority control of KES in March 0f 2005, financing the deal through a combination of non-convertible redeemable preferred stock and subordinated debt issued to the sellers. The result was a solidly profitable steel company with an extremely leveraged balance sheet. The company’s survival would depend on producing sufficient cash flow to service debt obligations and reduce the principal amount of these obligations over time. Fortunately, solid management and a cooperative economy allowed KES to generate large operating profits, reaching a new high as of March 31, 2012. Even in the extremely challenging economy of 2008 and 2009, the company still managed to produce operating and net income. Importantly, operating cash flow has tracked evenly with net income in aggregate since 2006, indicating these profits are more than just paper figures. Immediately after purchasing KES, ALJ Regional Holdings began working to reduce the company’s indebtedness. As of quarter’s end, total indebtedness (including preferred stock) stood at $49.65 million, less than half the 2006 figure of $100.99 million. As a result of the ongoing reductions to total indebtedness, the company’s liquidity and financial leverage ratios have improved to their best levels since the transaction was completed. ALJ has also made substantial progress toward building equity, reducing its negative book equity by $55.54 million since 2006. While much of the company’s indebtedness has been extinguished through operating cash flows, a portion was eliminated via stock for debt exchanges, which explains the large increase in shares outstanding since 2006. Additionally, a portion of the debt was eliminated by paying off accrued interest on the preferred stock at a discount to book value. So, what is the company worth? Highly leveraged operations often trade at discounted valuations, given their elevated risk of bankruptcy and restrictive debt covenants. As leveraged enterprises pay down debt, value accrues to the equity component of the company’s capital base, assuming operational profitability and EV/EBITDA ratio remain static. This value transfer to equity holders has been the case for ALJ. Over the last five years, the company’s share price rose by a little over 10% annually. This might not seem extraordinary, but the S&P 500’s total return was less than 2% annually over the same period. We can get a glimpse at the future through the company’s internal projections for fiscal 2012-2014, which are included in the 2011 annual report as part of the amended loan agreement with PNC Bank. The company projects continued operating profits and reveals plans to further reduce outstanding debt and preferred stock. I have summarized the projections, compared to 2011 and twelve trailing months results. By the end of 2014, the company expects cut its indebtedness nearly in half again and come close to recording positive book equity. Encouragingly, Q1 2012 results have the company ahead of expectations. If results remain strong, the company could pay off debt and build equity value even more quickly. With 59.4 million shares outstanding, the company’s current market capitalization is $25.9 million. 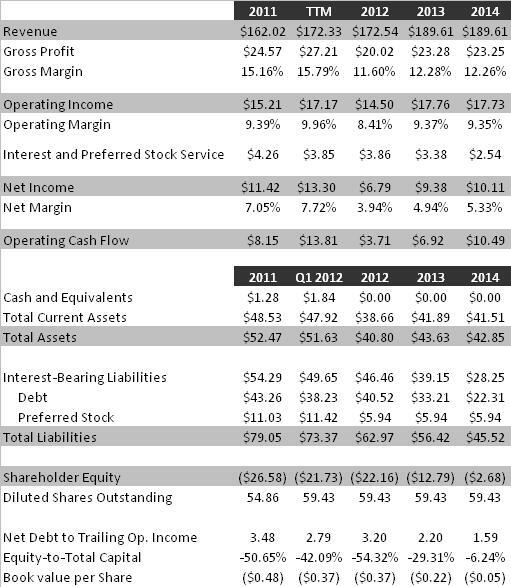 Adding net debt of $47.8 million gives a total enterprise value of $73.9 million. Trailing EBITDA stands at $17.6 million, yielding an EV/EBITDA ratio of 4.2. According to Bloomberg, the median EV/EBITDA ratio of domestic steel producers is 6.8. 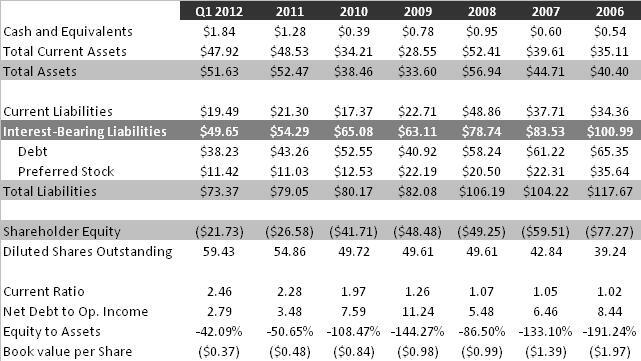 Based on these projections, it is possible to estimate the future value of the company. At the end of 2014, the company projects $28.25 million in net debt. The table below displays potential equity values under various EBITDA results (plan of $18.13 million, +/-10%, +/-20%) and at a range of EV/EBITDA ratios. The highlighted rows represent plan baseline results and the current EV/EBITDA ratio, with the bordered cell representing the intersection of each. The EV/EBITDA ratios range from a valuation even more conservative than the present at 3.7, to a 16.2% discount to median ratio at 5.7. If plan EBITDA of $18.13 million is achieved, the company’s equity value would have to nearly double just to maintain the same EV/EBITDA multiple. The following table converts the above values to per share equity values, assuming 10% dilution over the following three years. The current stock price is $0.435. Finally, the following table displays annualized equity return figures, assuming the present share price converges to the projected share prices over three years. If plan EBITDA results are achieved, a consistent EV/EBITDA ratio would result in attractive returns to equity holders. If the EV/EBITDA ratio expands in sympathy with decreased leverage, the results could be even better. ALJ does face a number of risks that could hamper equity returns. As a highly leveraged company, an economic downturn would seriously cut into net income and delay deleveraging efforts. A severe downturn could even result in default or necessitate additional equity financing. The cost of ALJ’s input, scrap steel, can swing wildly and affect gross margins significantly. Falling natural gas prices have provided a tailwind for the company, but a reversal would reduce profitability. ALJ’s workers are unionized and their contract expires in May 2013. A work stoppage would affect operations severely. ALJ’s board of directors believes the company’s shares are undervalued and approved a 2 million share buyback on June 1, 2012. The company will repurchase shares at any price below $0.50. An investment in ALJ Regional Holdings carries substantial risk, but offers significant rewards should the company’s deleveraging efforts succeed. Management has shown respectable results since acquiring KES and is substantially invested, aligning their interests with shareholders.